After a super day skiing at Mount Bachelor, it was time to move on to California. Medicine Lake Volcano (MLV) is fairly unknown and obscure, but it is the largest volcano in the Cascade Range, a huge shield with nearly double the volume of Mount Shasta. 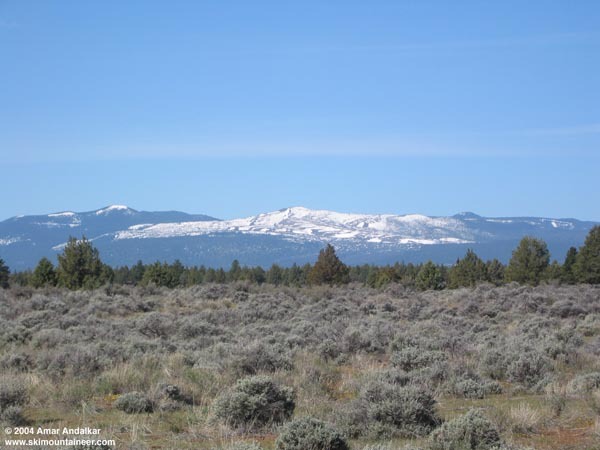 MLV is a near-twin of the more famous Newberry Volcano in Oregon, also having a large caldera which holds 2 lakes (one is very tiny) and numerous obsidian flows. The caldera of MLV is less scenic and less well-defined than Newberry, and access is also generally longer and more difficult, but there is much greater snowfall in an average year at MLV, about 50% more than Newberry. My objective this time was Glass Mountain, a truly enormous obsidian flow which dominates the northeast flank of the caldera rim, stretching over 5 miles across and about 10 times the size of the better-known Big Obsidian Flow at Newberry. The summit dome of Glass Mountain reaches 7622 ft, and the eastern lobes of the flow drop over 2500 vertical feet down the flanks of the volcano. Access to the east flanks of Glass Mountain begins from either a working (in summer) pumice mine at 5800 ft on Forest Road 44N08 or an abandoned pumice mine at 5800 ft on FR 43N02, both of which are reached via FR 97 from SR 139. A deeply snow-covered obsidian flow (or any lava flow such as this) provides ideal ski terrain, since it is completely open and treeless despite being well below timberline in this case, and numerous steeper rolls and dips help keep the skiing fun. Unfortunately, when the snowpack is shallow, the numerous ribs and large lava blocks and hidden hollows make skiing (or any travel at all) on such a flow very difficult and treacherous, and even ascending the typically-steep margin to get onto the flow is a challenge. Despite a huge winter which left snowdepths nearly 200% of normal by March 1 throughout the California Cascades, the very hot and dry weather of March and April has rapidly settled and then melted the snowpack, especially below 6-7000 ft and in sun-exposed areas. I was stunned to find that Glass Mountain was already 50% bare of snow, and not in particularly appealing condition for skiing. The road 43N02 was driveable to 5600 ft before being blocked by snow, but a quick jaunt up to 6000 ft found only 2-3 ft of snow and all access onto the obsidian flow was completely melted out. The other road 44N08 was driveable all the way to the pumice mine at 5800 ft, and snow coverage there was more substantial, but after an hour spent exploring around up to 6100 ft, it seemed prudent to abandon the effort. I probably could have found a mostly-skiable route all the way to the top of Glass Mountain, but several carries across razor-sharp obsidian ribs would have been required, and it was also getting past noon, making travel under the hot sun sloppy and difficult. I guess I'll have to come back and try again earlier next year (unless some huge April snowstorms as in 2003 can rebuild this year's snowpack, but that is very unlikely). Anyway, I spent the rest of the afternoon exploring several lava tube caves at Lava Beds National Monument on the northern flanks of MLV, quite a contrast from the brilliant snowfields and sunshine of the morning. This view looks west from FR 97 towards the shield of Medicine Lake volcano with the bare salt-and-pepper Glass Mountain (7622 ft) dominating the center, with snowcapped Lyons Peak (7903 ft) to its left and the forested knob of Mount Hoffman (7913 ft, highest point on MLV) barely visible just to its right. Click here for a double-size version of this photo.